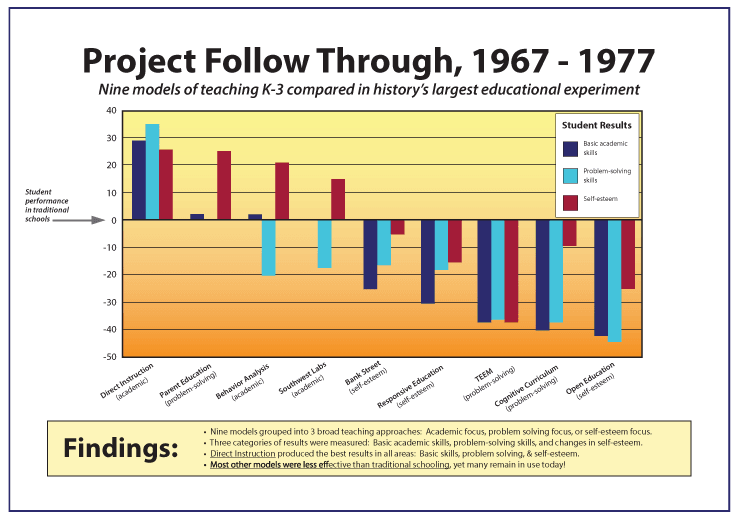 There was an enormous educational experiment beginning in 1968 comparing these two approaches called Project Follow Through. It was the most extensive educational experiment ever conducted. Beginning in 1968 under the sponsorship of the American federal government, it was charged with determining the best way of teaching at-risk children from kindergarten through grade 3. Over 200,000 children in 178 communities were included in the study, and 22 different models of instruction were compared. So which preschool method was the winner? The answer might seem obvious from the table above but you would be mistaken. The approach that now dominates is the High/Scope Perry preschool approach – and this is to some extent on the basis of two very small and problematic studies. What is “…just plain bizarre, is that [Schweinhart and Weikart] barely entertain the possibility that: (1) a dozen years of school experience; (2) area of residence; (3) family background; (4) the influence of gangs; and (5) differential economic opportunity, had anything to do with adolescent development and adult behavior. In this post I will look at the impact of these studies on early years education. First: These studies have been crucial in building a case for the importance of preschool education in the early years of childhood. The National Audit Office commissioned a summary of the evidence on the impact of early years’ provision on young children with emphasis given to children from disadvantaged backgrounds in 2004. Such a paper offers a good review of the key research literature that has been influencing public policy. The evidence of the biggest ever educational experiment “Project Follow Through” does not feature but both tiny Perry preschool studies feature heavily in the report. The second study of 123 subjects is one of six randomised controlled trials cited to provide evidence of the effectiveness of preschool programmes for disadvantaged children. These trials were all small scale and to an extent have contradictory findings. Some found reductions in antisocial behaviour but not academic gains and others had the opposite findings. None of the trials seemed to offer better evidence than the problematic second Perry study of 123 subjects. I’d need to do much more research to comment further. What is very interesting to me is that that there is no doubt the much publicised benefits of preschool education are built on shakier foundations than advocates would like policy makers to think. If you are interested in forming an opinion, this post , this and this post and this riposte are a great starting point. There is a very concerning reliance on the Schweinhart and Weikart Perry preschool studies in the National Audit Office report. 1. The shockingly ‘dodgy’ first study (see my previous post) is relied upon to define ‘high quality’ child care. Oh my goodness! How can the study referred to possibly support the weight being placed on it (see first half of my previous post)? The National Audit Office report writer considers it a central plank in research used to define ‘high quality’ child care when it is hopelessly flawed. The early results of project Follow Through (with 9000 children assigned to nine early childhood curricula) showed that disadvantaged children who received Direct Instruction (anathema to those advocating child led approaches) went from the 20th to about the 50th percentile on the Metropolitan Achievement Test. Children who received the Perry High/Scope curriculum did not do as well. They fell from the 20th percentile to the 11th percentile. 2. It is a concern that the second Schweinhart and Weikart study is used to demonstrate the cost effectiveness of preschool education in the National Audit Office report. This is troubling given the small size and context of the original study. It can’t possibly support these inferences. Second: This research on impact of education in children’s early years has been used to justify our statutory Early Years Foundation Stage. 1. We know the first flawed Schweinhart and Weikart Perry study contributed towards this idea of ‘high quality’ provision but it did not actually improve academic outcomes for its young participants. Evidence such as Follow Through (from the same era is) not even mentioned which did improve academic outcomes. The Perry programme was viewed as worthwhile because it was believed this intervention limited adult anti-social behaviour. “The Perry program initially boosted IQs. However, this effect faded within a few years after the end of the two-year program, with no statistically significant effect remaining for males, and only a borderline significant effect remaining for females. 2. I believe good parenting makes a difference to children and so, although the studies seem unconvincing it is not outside the realms of possibility that the committed teachers involved in the second Schweinhart and Weikart study had some positive impact on their pupils. They were a highly committed team of extremely well qualified teachers. They must have involved themselves deeply in the lives of their very disadvantaged, very low IQ pupils, given they made 90 minutes visits every week to their homes as well as teaching them. Such a scheme is not really more widely replicable though. Also, given the range of possible benefits the children experienced it is quite a leap to pin point the child-led learning as a crucial factor and suggest it provides a model of ‘high quality’ pre-schooling for all children today. Some of the many subsequent studies on the effectiveness of preschool education record academic gains and others don’t. Some record social gains and others don’t. However, partly thanks to the Schweinhart and Weikart studies the importance of the ‘high quality’ preschool education is a mantra repeated by all politicians. The Perry approach has become a model for ‘high quality’ preschool education around the world and currently, about 30 percent of all Head Start centres in America offer a version of the Perry curriculum (ICPSR 2010). For those, like myself, concerned that ‘child-led’ approaches are not the most efficacious, the impact of these studies is an enormous cause for concern. So why are two small, context dependent flawed studies still widely cited? Why are the results of the largest ever educational experiment from the same era ignored in early years research literature? There is only one possible explanation. The small studies said what educationalists wanted to hear, that a child led curriculum could be proved to effect life outcomes. The enormous Project Follow Through had more uncomfortable findings – so it was ignored. Next Is grouping pupils by ability ‘iniquitous’? Reblogged this on Esse Quam Videri. This is important work you are doing–keep it up! Although I’m aware of the Project Follow Through findings in favour of DI, I really don’t know very much about EY or Primary education, so this is a rather generic comment; I hope it’s of some use. This business of certain reasearch studies becoming prominent whilst others don’t is not confined to education research. I read this paper recently Greenberg S. (2009) How citation distortions create unfounded authority: analysis of a citation network. British Medical Journal, 339(7714) pp.210-213 (possibly via I Think You’ll Find… Ben Goldacre’s book, which is an eye-opener for anyone thinking that medical research makes education research look completely useless). Early selective citation can have a permanent impact on later understanding because researchers don’t tend to go back to the original sources. Look at Hattie and the number of people who took Visible Learning at face value. That’s a really important work but also deeply flawed, and it’s still not really been properly deconstructed. The Project Follow Through findings are becoming better known but equally there are a few people getting carried away and citing the success of DI in disadvantaged elementary schools in the USA as if it offers unambiguous support for any form of whole class teaching for secondary ages in the UK. Academics, policy-makers, and teachers, all need to be careful about how they use evidence, particularly if they haven’t checked it thoroughly themselves. Cleary the Project Follow Through research shows that Direct Instruction is the best instructional method for concrete skills that are the foundation of early childhood education. There should be no question about that fact and we should be careful not to apply direct instruction to any and every educational context. Dodiscimus points out the propensity for the medical field to make similar mistakes in accepting and promoting faulty research. F.A. Hayek, the Nobel winning economist called this scientism, and no field is immune to its follies. Would love to see more of that open and vigorous testing of ideas in education.